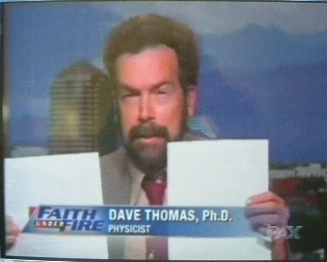 Details for the "George Harrison Cluster in War and Peace"
From the "Faith Under Fire" episode of June 4, 2005: Dave Thomas holds a print-out of the entire passage used from War and Peace to develop the "Harrison Cluster" matches shown below. The passage, 8968 characters long, can easily be printed on just two standard pages. The ENTIRE contents of this short passage follow. All of the hidden matches following were found contained completely within this passage. ...t this on the seat and this to the right." Princess Mary rose and moved to the door, then stopped and said: "Andrew, if you had faith you would have turned to God and asked Him to give you the love you do not feel, and your prayer would have been answered." "Well, may be!" said Prince Andrew. "Go, Masha; I'll come immediately." On the way to his sister's room, in the passage which connected one wing with the other, Prince Andrew met Mademoiselle Bourienne smiling sweetly. It was the third time that day that, with an ecstatic and artless smile, she had met him in secluded passages. "Oh! I thought you were in your room," she said, for some reason blushing and dropping her eyes. Prince Andrew looked sternly at her and an expression of anger suddenly came over his face. He said nothing to her but looked at her forehead and hair, without looking at her eyes, with such contempt that the Frenchwoman blushed and went away without a word. When he reached his sister's room his wife was already awake and her merry voice, hurrying one word after another, came through the open door. She was speaking as usual in French, and as if after long self-restraint she wished to make up for lost time. "No, but imagine the old Countess Zubova, with false curls and her mouth full of false teeth, as if she were trying to cheat old age.... Ha, ha, ha! Mary!" This very sentence about Countess Zubova and this same laugh Prince Andrew had already heard from his wife in the presence of others some five times. He entered the room softly. The little princess, plump and rosy, was sitting in an easy chair with her work in her hands, talking incessantly, repeating Petersburg reminiscences and even phrases. Prince Andrew came up, stroked her hair, and asked if she felt rested after their journey. She answered him and continued her chatter. The coach with six horses was waiting at the porch. It was an autumn night, so dark that the coachman could not see the carriage pole. Servants with lanterns were bustling about in the porch. The immense house was brilliant with lights shining through its lofty windows. The domestic serfs were crowding in the hall, waiting to bid good-by to the young prince. The members of the household were all gathered in the reception hall: Michael Ivanovich, Mademoiselle Bourienne, Princess Mary, and the little princess. Prince Andrew had been called to his father's study as the latter wished to say good-by to him alone. All were waiting for them to come out. When Prince Andrew entered the study the old man in his old-age spectacles and white dressing gown, in which he received no one but his son, sat at the table writing. He glanced round. "Going?" And he went on writing. "I've come to say good-by." "Kiss me here," and he touched his cheek: "Thanks, thanks!" "What do you thank me for?" "For not dilly-dallying and not hanging to a woman's apron strings. The Service before everything. Thanks, thanks!" And he went on writing, so that his quill spluttered and squeaked. "If you have anything to say, say it. These two things can be done together," he added. "About my wife... I am ashamed as it is to leave her on your hands..." "Why talk nonsense? Say what you want." "When her confinement is due, send to Moscow for an accoucheur.... Let him be here...." The old prince stopped writing and, as if not understanding, fixed his stern eyes on his son. "I know that no one can help if nature does not do her work," said Prince Andrew, evidently confused. "I know that out of a million cases only one goes wrong, but it is her fancy and mine. They have been telling her things. She has had a dream and is frightened." "Hm... Hm..." muttered the old prince to himself, finishing what he was writing. "I'll do it." He signed with a flourish and suddenly turning to his son began to laugh. "It's a bad business, eh?" "What is bad, Father?" "The wife!" said the old prince, briefly and significantly. "I don't understand!" said Prince Andrew. "No, it can't be helped, lad," said the prince. "They're all like that; one can't unmarry. Don't be afraid; I won't tell anyone, but you know it yourself." He seized his son by the hand with small bony fingers, shook it, looked straight into his son's face with keen eyes which seemed to see through him, and again laughed his frigid laugh. The son sighed, thus admitting that his father had understood him. The old man continued to fold and seal his letter, snatching up and throwing down the wax, the seal, and the paper, with his accustomed rapidity. "What's to be done? She's pretty! I will do everything. Make your mind easy," said he in abrupt sentences while sealing his letter. Andrew did not speak; he was both pleased and displeased that his father understood him. The old man got up and gave the letter to his son. "Listen!" said he; "don't worry about your wife: what can be done shall be. Now listen! Give this letter to Michael Ilarionovich. * I have written that he should make use of you in proper places and not keep you long as an adjutant: a bad position! Tell him I remember and like him. Write and tell me how he receives you. If he is all right- serve him. Nicholas Bolkonski's son need not serve under anyone if he is in disfavor. Now come here." * Kutuzov. He spoke so rapidly that he did not finish half his words, but his son was accustomed to understand him. He led him to the desk, raised the lid, drew out a drawer, and took out an exercise book filled with his bold, tall, close handwriting. "I shall probably die before you. So remember, these are my memoirs; hand them to the Emperor after my death. Now here is a Lombard bond and a letter; it is a premium for the man who writes a history of Suvorov's wars. Send it to the Academy. Here are some jottings for you to read when I am gone. You will find them useful." Andrew did not tell his father that he would no doubt live a long time yet. He felt that he must not say it. "I will do it all, Father," he said. "Well, now, good-by!" He gave his son his hand to kiss, and embraced him. "Remember this, Prince Andrew, if they kill you it will hurt me, your old father..." he paused unexpectedly, and then in a querulous voice suddenly shrieked: "but if I hear that you have not behaved like a son of Nicholas Bolkonski, I shall be ashamed!" "You need not have said that to me, Father," said the son with a smile. The old man was silent. "I also wanted to ask you," continued Prince Andrew, "if I'm killed and if I have a son, do not let him be taken away from you- as I said yesterday... let him grow up with you.... Please." "Not let the wife have him?" said the old man, and laughed. They stood silent, facing one another. The old man's sharp eyes were fixed straight on his son's. Something twitched in the lower part of the old prince's face. "We've said good-by. Go!" he suddenly shouted in a loud, angry voice, opening his door. "What is it? What?" asked both princesses when they saw for a moment at the door Prince Andrew and the figure of the old man in a white dressing gown, spectacled and wigless, shouting in an angry voice. Prince Andrew sighed and made no reply. "Well!" he said, turning to his wife. And this "Well!" sounded coldly ironic, as if he were saying,: "Now go through your performance." "Andrew, already!" said the little princess, turning pale and looking with dismay at her husband. He embraced her. She screamed and fell unconscious on his shoulder. He cautiously released the shoulder she leaned on, looked into her face, and carefully placed her in an easy chair. "Adieu, Mary," said he gently to his sister, taking her by the hand and kissing her, and then he left the room with rapid steps. The little princess lay in the armchair, Mademoiselle Bourienne chafing her temples. Princess Mary, supporting her sister-in-law, still looked with her beautiful eyes full of tears at the door through which Prince Andrew had gone and made the sign of the cross in his direction. From the study, like pistol shots, came the frequent sound of the old man angrily blowing his nose. Hardly had Prince Andrew gone when the study door opened quickly and the stern figure of the old man in the white dressing gown looked out. "Gone? That's all right!" said he; and looking angrily at the unconscious little princess, he shook his head reprovingly and slammed the door. I searched for 34,028 7-letter words, 52,672 8-letter words, and 22,072 9-letter words, all randomly selected from dictionary files. Using my own C++ Bible Code application, I found 1,437 7-letter words, 98 8-letter words, and 2 9-letter words in the above 2-page portion of Text from War and Peace. ALL of these words are "Hidden in Code" in the two-page excerpt from War and Peace shown above!